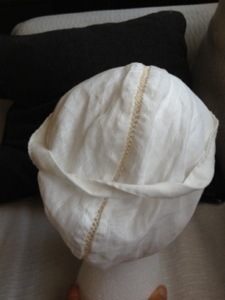 I brought my medieval clothing a back to California after my latest trip to Sweden, and needed something nice and cool to cover my head, and therefore decided to make the popular Birgitta (in Englis ‘Bridget’) Cap (Sweden 14th century). Birgitta (1303-1373) was a the founder of a the Bridgettines nuns and monks, and was canonized 1391. 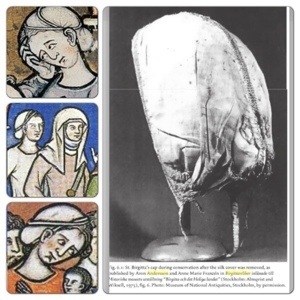 There is a couple of medieval illustrations of the cap, but most important the very nicely preserved original cap. 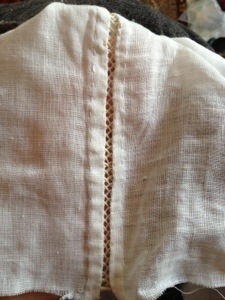 I start with two pieces of linen, hemming both if the back seam separately. Basically just a 25×25 cm square that I rounded of in one corner. 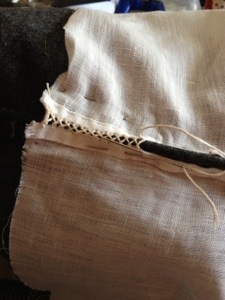 According to Åsas research, the back isn’t stitched all the way, which will help keeping it in place, so I leave about 5 cm and finish the stitch simply by wrapping it around it self. 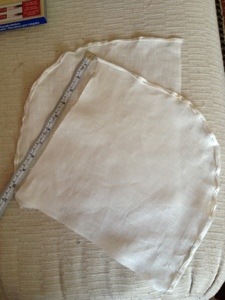 The backside is then pleated and stitched. 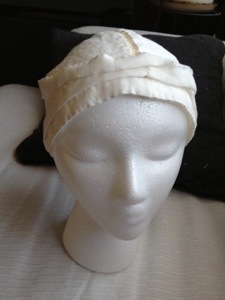 The band that keep the cap attached to your head looks in the original that it is a folded piece of linen, so I cut out one piece (150×3 cm and fold it to a 2 cm wide band. 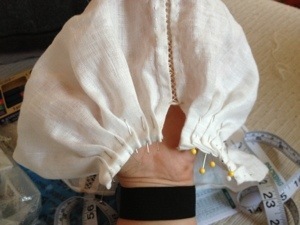 It’s going to become one big loop, but I don’t know yet exactly how long, so I start attach it in the back, so that the seam isn’t going to end up in the somewhere visible. 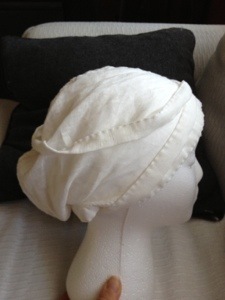 This entry was posted in medieval and tagged 14th century, headpiece, medieval, Sweden.